A nonagenarian and a recently divorced reporter meet weekly for dinner, and the discussion ranges from the importance of beauty, to living after loss, to the power of love to redeem and renew, to how to make a succulent duck breast. When Isabel meets Edward, both are at a crossroads: he wants to follow his late wife to the grave, and she is ready to give up on love. Thinking she is merely helping Edward's daughter - who lives far away and asked her to check in on her nonagenarian dad in New York - Isabel has no idea that the man in the kitchen baking the sublime roast chicken and light-as-air apricot soufflé will end up changing her life. Dinner with Edward is a book about sorrow and joy, love and nourishment, and about how dinner with a friend can, in the words of M. F. K. Fisher, "sustain us against the hungers of the world." I heard about the promise Edward made to his dying wife long before I met him. Valerie, Edward's daughter and one of my oldest friends, related the story when I saw her shortly after her mother's death. Paula, who was just shy of her ninety-fifth birthday and had been bedridden and drifting in and out of consciousness for days, sat up in bed specifically to address her beloved husband. "Listen to me, Eddie." Paula spoke firmly, emphatically. "You can't come with me now. It would be the end of our little family." Despite each chapter opening with a menu, there are no recipes here per se, just a few pointers regarding pastry and scrambled eggs. This is a bit of a disappointment given that "foodoirs" (memoirs about food, especially ones that include recipes) are among my favorite things to read. I also wish the book could have been a little bit longer. Still, it is a delightful blend of memoir, biography, food writing, and life lessons. Like Mitch Albom's Tuesdays with Morrie, it's a book that makes you think about the things that matter in life: love, family, and making the most of the time you have. (Reviewed by Rebecca Foster). This is a book full of life lessons, a reminder that no matter how old we grow, we still have much to share, and to learn. Vincent fills her pages with accounts of her life and Edward's past, but for readers, the narrative becomes lighter on epiphany than calories. Starred Review. Vincent's descriptions of food, written with the sumptuous detail of a restaurant review, are something to savor, as are her recollections of Edward himself and the way he dedicated himself to living after having lost the love of his life. Although the food (I am partial to the roast chicken, lovingly described) is excellent, it is the charming, sweet, and effortlessly wise company that makes this sweet read a charming way to pass a day. Over mouthwatering dinners, an odd couple ... engage in a series of discussions, from the importance of beauty, to living after loss, to the power of love to redeem and renew, to how to make a succulent duck breast. I loved every moment of this book. In Dinner with Edward, Isabel Vincent's memoir, Edward's two tricks for making a perfect pastry crust are crushed ice and a mixture of grated butter and fresh lard (from his Queens butcher), all kept as cold as possible. What are other chefs' top tips? The choice of fat(s) and their proportions are the main differences. Julia Child's shortcrust pastry recipe in Mastering the Art of French Cooking suggests butter to (vegetable) lard in a ratio of 3:1. One should use chilled butter and cold water and work as quickly as possible. "The mixing of pastry should be accomplished rapidly, particularly if your kitchen is warm, so that the butter will soften as little as possible." 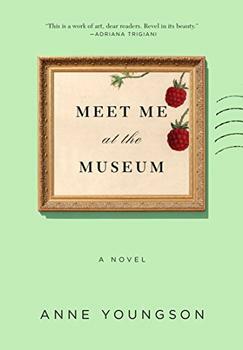 Anne Youngson's Meet Me at the Museum is a celebration of long letters, kindred spirits, and the possibility of writing a new story for yourself, at any stage of life. A wise and entertaining novel about a woman who has lived life on her own terms for seventy-five defiant and determined years, only to find herself suddenly thrust to the center of her family's various catastrophes.